Start with Your Shiatsu Journey! The Chair-Shiatsu Certificate Course is delivered for 3.5 weeks to complete (63 hours). The shortest and good way to start with Shiatsu journey or for manual therapists to have as an add-on. 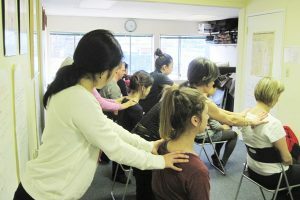 Students learn Shiatsu theory, Self-Shiatsu and 10/20-min Chair-Shiatsu treatment. Upon successful completion of this course, students will receive a certificate which is transferable to the 1070-hour Shiatsupractor diploma program. Basic Shiatsu concepts are studied including such subjects as Characteristics of Shiatsu, Shiatsu and Physiological Functions, Operations of the hands and fingers, kinds of pressure application, and contraindications to Shiatsu. Self-administered Shiatsu teaches the student basic use of the hands, correct pressure application methods and all the basic pressure points. This is good for health-conditioning. The students practise 10-min and 20-min Chair Shiatsu Treatment on each others. Uniform, equipment, clinical report file, handout and student record are included in additional fee. Textbooks are not included in the additional fee. Textbooks are separately purchased by the student. A list of the required textbooks is available upon enrolment. As we are approved by the Ministry of Human Resources Development Canada as a certified educational institution, our students may qualify for a tuition tax credit. **Additional Fee is not included in Total Program Fee. The Course has a minimum and a maximum student enrolment in order to ensure ample individual instruction when required. If the applicant fails to meet the minimum admission requirements, neither the School nor the Applicant may waive the requirement that the applicant must be nineteen years of age or older to be accepted into the Canadian College of Shiatsu Therapy. b) Fill out and submit the Application Form with a $100.00 Application Fee. The fee will be applied to the tuition fees upon acceptance or returned to you if your application is not approved. c) Read and understand the School Policy and mission statement. d) The Student and the School’s Representative (Signing Officer) sign the Enrolment Contract.